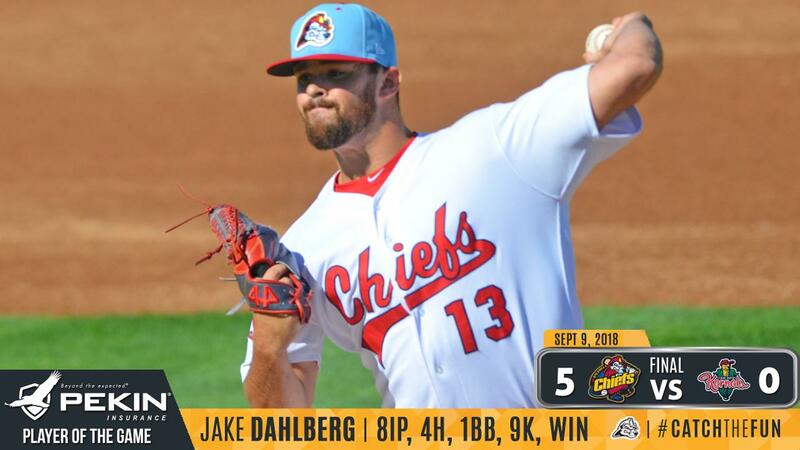 Peoria, IL - The Peoria Chiefs got eight shutout innings and a career-high nine strikeouts from lefty Jake Dahlberg and used a five-run inning to beat Cedar Rapids 5-0 and sweep their way to the Midwest League Championship Series. The Chiefs last played in the MWLCS in 2002 when they won their first title and the series will start in Peoria at 6:30 p.m. Wednesday. Cedar Rapids had the first good chance of the day in the top of the third. Trey Cabbage led off with a triple to right but Akil Baddoo hit a grounder to second and Nick Dunn threw out Cabbage at the plate for the first out of the inning. From there the Kernels didn't threaten again until the ninth. The Chiefs broke through in the bottom of the third against Blayne Enlow. Nick Plummer drew a lead off walk and Justin Toerner followed with a single to center. With one out Luken Baker was hit by a pitch and Zach Kirtley put the Chiefs on top 2-0 with a single to right-center. Dennis Ortega reached on a leadoff single to load the bases again and Dunn's single to left put the Chiefs on top 3-0. Nolan Gorman grounded out to first as a run scored for a 4-0 lead and Ortega came home on a wild pitch for a 5-0 Chiefs lead. From there Dahlberg went to work. He racked up a professional career high nine strikeouts over eight shutout innings with just four hits allowed and one walk. CJ Saylor struck out the lead off man in the ninth before allowing two singles. Patrick Dayton took over on the mound and struck out the final two Kernels to preserve the 5-0 win. Notes: The Chiefs have shutouts in both home wins in the 2018 playoffs…Dunn has hits in all four playoff games…He also has three RBI in the playoffs…The Chiefs are 4-2 in Western Division Finals and 8-3 in conference finals games all-time…The Chiefs are 4-4 against the Kernels overall in the postseason with games in 2002, 2009 and 2015…Every playoff series between the two teams has been a sweep…All-time the Chiefs are 9-11 against Iowa teams in the playoffs…The Chiefs also made the MWL Championship Series in 1985, 1986 and 2002…They lost the first two and won in 2002…The Chiefs will face either Bowling Green or West Michigan in a Best-of-Five MWL Championship Series…The Chiefs will host game one on Wednesday at 6:30 p.m. and game two on Thursday at the same time…The Eastern Division champion will host games 3, 4 and 5 on Saturday, Sunday and Monday…Tickets for the two home games go on sale at 10:00 a.m. Monday both online and at the Dozer Park Box Office and are $13 for Dugout Box, $11 for Field Box and $8 for Lawn Seats…Suite tickets are $20 for individuals or $150 for a group of ten and are available by calling 309-680-4000…Wednesday's Game is a Bang for your Buck Wednesday with $1 hot dogs, $1 nachos and $1 popcorn…Thursday is a Beer & Brat Thirsty Thursday with $2 draft beers and $3 craft beers, brats and margaritas…The broadcast with Voice of the Chiefs Nathan Baliva can be heard, starting with the Pre-Game Show at 6:15 p.m. on www.peoriachiefs.com/listenlive and is also available on the Peoria Chiefs Network in the Tune-In Radio App…The game is also available to subscribers on MiLB.TV.